Should progressives focus more on promoting growth, or fostering redistribution? The unfortunate fact is that we live in an era of weak productivity growth. That means growth policies to encourage investment and innovation are essential for broad prosperity. Based on today’s release from the BLS, ten-year productivity growth has now plunged to 1.4%, the lowest level since the 1980s (see chart below). By comparison, ten-year productivity growth was 2.2% when Bill Clinton left office at the end of 2000, and hit a high of 3% at the end of 2005. Productivity growth is the central force determining the size of the economic pie. Without productivity gains, living standards cannot show a sustainable rise. Certainly real compensation growth is very weak as well. 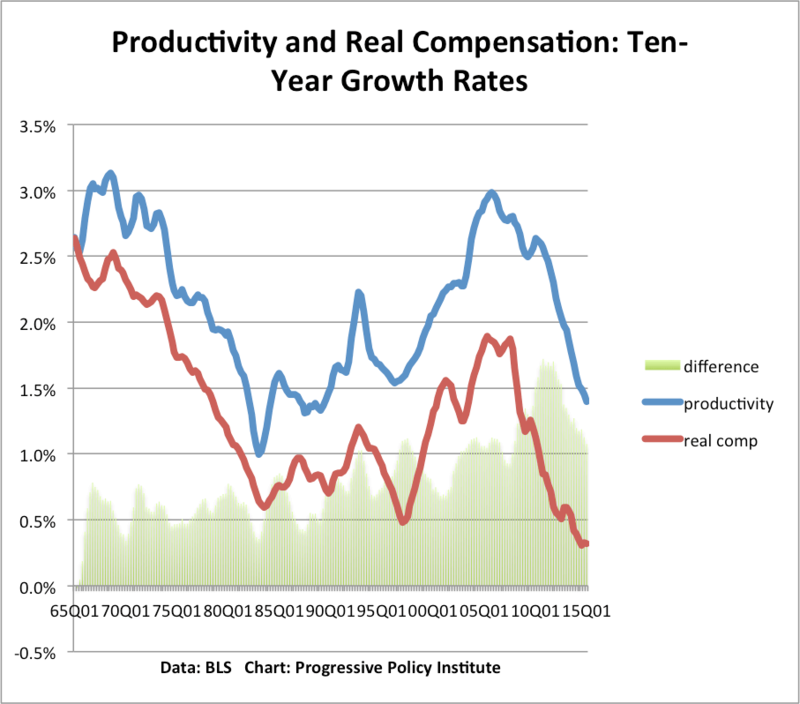 However, the difference between ten-year productivity growth and ten-year real compensation growth has also been narrowing. It was 1.1 percentage points as of the first quarter of 2015, after peaking at 1.7 percentage points in 2011. That difference of 1.1 percentage points is only slightly above the 50-year average of 0.8 percentage points. To put it a slight different way, real compensation growth has fallen from 1.5% in 2000 to 0.3% today, a catastrophic drop. However, two-thirds of that plunge can be attributed to a drop in productivity growth (from 2.2% to 1.4%), and only one-third to a widening of the gap between productivity and compensation growth. My conclusion: The sharp fall in productivity growth is the major reason why Americans feel so squeezed. Growth policies are key.